It's safe and easy to remove eyelash extensions yourself in the comfort of your own home. They are attached to your natural lashes with semi-permanent glue, making the removal of eyelash extensions a delicate yet easy-to-follow process. Learn how to gently remove false eyelashes without damaging your natural lashes or, more importantly, your eyes. If you're wearing any makeup, use a gentle makeup remover or two-in-one makeup remover and cleanser to return your face to a bare state. Then, thoroughly wash your face. Fill a large bowl with steaming hot water, carefully place your face directly over the bowl, and completely cover your head with a large towel. Hold here for approximately 10 to 15 minutes as this will help soften the glue and encourage release of the extensions. Dip a cotton ball or pad in the olive or coconut oil and gently swipe along your lash line, helping the extensions slide right off. You may need to repeat this step to dissolve the glue completely. Once the extensions slide off, rinse your face with warm water to remove any excess oil. Apply a moisturizer or hydrating face oil to nurture skin and bring lashes back to their original state. Keep in mind you do not want to pluck the false lash as this unsafe method can do damage to your natural lash and is not recommended. You should see the false lashes come off on the cotton ball or pad, or notice them dropping off. If lash extensions are stubborn and you have difficulty removing them all, go back to the professional who applied them to help with removal. Eyelash extensions enhance the appearance of the length, volume, and thickness of your natural lashes for sultry eyes. They are fun to flaunt and the application process is easy to understand. Lash extensions will follow your lashes' natural growth cycle, which is around 30 to 45 days, and will often shed with the natural lash. 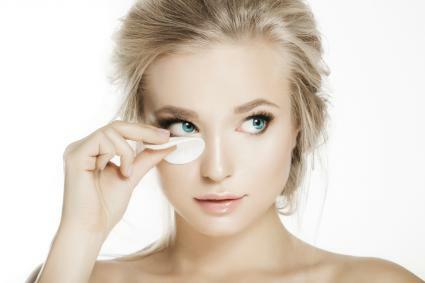 Properly caring for your lashes will ensure they last the projected time. It is not recommended to wear mascara, and you really shouldn't have to. But if you feel like you need an extra boost of volume, you can use an oil-free mascara on the tips once they grow out a bit. It's best to sleep on your back if at all possible so that your face doesn't hit the pillow and absolutely do not wear an eye mask. Anything pressing on your lashes can irritate them or point them in the wrong direction. Don't pull, pluck, twist, or fuss with the extensions. Eyelash extensions are not exactly a low-maintenance affair, but they sure do create some serious glamour. If you fall head over heels with your trendy extensions and want to keep them, it's best to go back for touch-ups within three to four weeks rather than removing them and starting all over again. But if it's just a spontaneous one-time thing, you can safely remove the extensions at home.